Zenawi Bowen scored the game-winning goal in the 105th minute to give the Thomas College Men's Soccer team a 2-1 North Atlantic Conference (NAC) win over SUNY Canton at Smith Field. 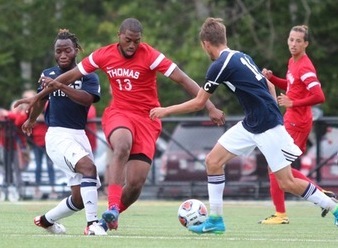 Thomas College Men’s Soccer feature 7 Bermuda players on their roster that includes MacQuille Walker, Justin Bell, Jahzardae Samuels, Jahkeylo Burgess, Bowen, Jaavaid Warren-Smith and Darin Woolridge. The SUNY Canton lead would stand until the 86th minute, when Michael Sanzari forced overtime with his fifth goal of the season. Both goaltenders turned in stellar performances, with Jonathan Dutka making seven saves in the win. SUNY Canton's Mouhammed Thiam took the loss, making nine saves on 11 shots.